Imagine a town with the largest classification railroad yard in the world. Think of a place where the military trains roared through during World War II carrying six million servicemen. Volunteers offered all of these passengers food, coffee, and cigarettes at the depot’s canteen. Learn of a 1913 post office in that town being revived to become an art training center and gallery as well as a community meeting center. That town is North Platte, Nebraska. Before North Platte had its current name, it was called “Hell Town on Wheels.” It started when Union Pacific’s chief engineer Grenville Dodge platted the town during the construction of the transcontinental railroad, selecting it as a railroad “division point.” It was chosen because of its central location that was midway on the Union Pacific routes between Chicago and Salt Lake City and halfway between Denver and Omaha. That the land was flat and near water were other considerations. The first train rolled through what was called “Hell Town on Wheels” in 1866. Dodge constructed major shop facilities and a roundhouse that year, and by 1867, main line operations of the Union Pacific began. In 1869, the driving of the Golden Spike occurred at Utah’s Promontory Summit with the transcontinental railroad crossing two-thirds of western North America. In 1874, North Platte officially became a city. After World War II, the Union Pacific began developing Bailey Yard. As a “division point” for Union Pacific, North Platte is where trains are sorted, railroad crews are exchanged, and maintenance and repairs are performed on equipment. It became a hump yard in 1948 with 42 tracks. In 1968, another hump yard with 64 tracks was added followed by a diesel locomotive shop in 1971 and a railroad car shop in 1974. The 1948 hump yard was replaced in 1980 with a new 50 track yard. In 1995, the Guinness Book of Records called Bailey Yard in North Platte the largest railroad classification yard in the world. It was named in honor of Edd H. Bailey, who served as the railroad’s president between 1965 and 1971. He continued as a member of the board of directors until 1974. The yard covering 2,850 acres is eight miles long and two miles wide. It’s the size of 2,800 football fields. It has 200 separate tracks totaling 315 miles in length, 766 turnouts, and 985 switches controlled by computers. 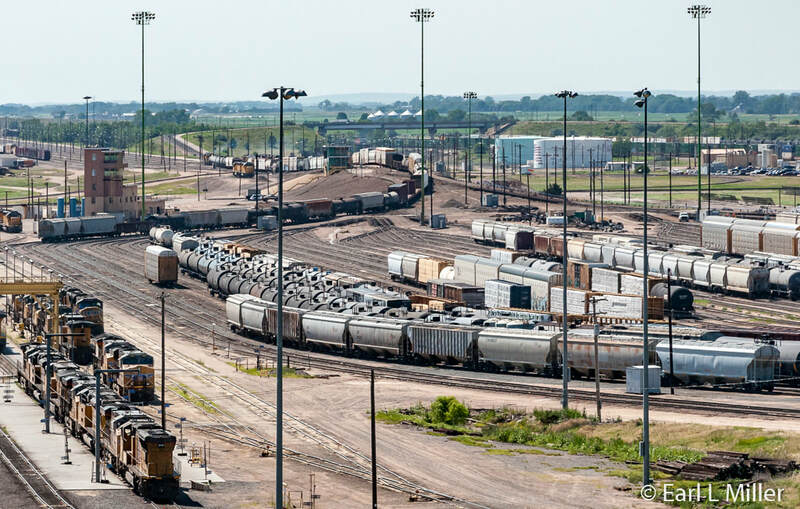 The yard handles daily 14,000 rail cars, an average of between 139 and 150 trains, via 17 receiving and 16 departure tracks. On a typical day, you will see loaded coal car trains from Wyoming. These can be as long as 8,000 feet - up to 300 cars. You will also see manifest trains with a mixture of tank cars, box cars, piggyback train cars, etc. Intermodal trains haul truck and ship refrigerated containers. None of the cars carry passengers or livestock. The average train is about 100 cars long. 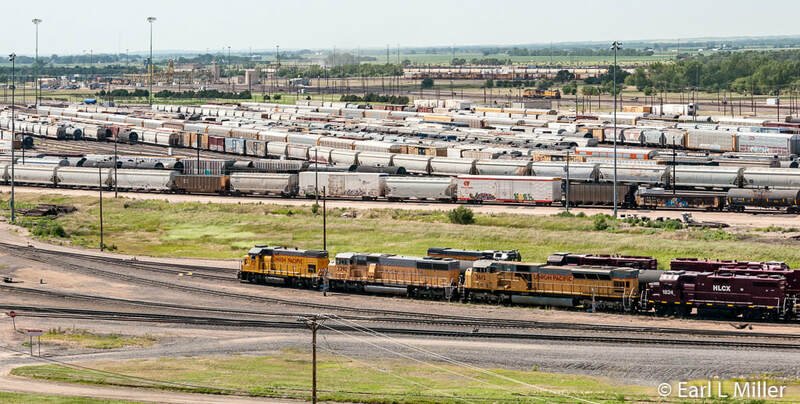 Approximately 3,000 cars are sorted daily by east and west direction before entering Bailey Yard’s hump yards where they are classified further. The destination is encoded on a bar code on the side of the car and then scanned and entered into the yard’s computer system. Eastbound trains use a hill cresting at 34 feet while the one for those headed west is 20 feet. The west hump is a smaller operation. Locomotives push trains to the top of the hump where workers manually separate the cars. Cars then roll individually, at a gentle four miles an hour, into any of 114 “bowl” tracks (49 tracks for westbound trains and 65 for eastbound). There they join trains headed for the same destinations in North America, Canada, and Mexico Each track has a designated destination. Gravity, computer tracking of the cars and the many switches and braking mechanisms on the tracks bring the cars to their new trains. Some trains, known as “unit cars” don’t need to be sorted at all. They are trains carrying one kind of cargo going to a single destination. Instead of going through the hump, they are put through Bailey Yard’s giant service track before being sent on their way. Bailey Yard’s train operations and repair shops are open 24/7. Each month, the Yard’s three locomotive fueling and service centers process more than 8,500 locomotives. They repair 750 of them using overhead cranes and elevated work bays to maintain fluid operations. The facility uses 18 million gallons of diesel fuel monthly and repairs nearly 50 cars daily. It has 18 tracks used only for coal cars that have to sit idle for a while. Each year, the on-site car repair shop replaces 10,000 pairs of wheels. Identification is done through an in-motion defect detector that was developed by Union Pacific. It uses ultrasound technology to inspect each wheel and is the only one of its type in the world. Locomotives can be serviced in a NASCAR-like pit stop called a Run-Thru. It’s staffed by an electrician, machinist, fireman oiler, and a carman. Locomotives are serviced in 45 minutes without detaching them from their trains. An on-site command center at Bailey handles all of the train movement throughout the yard via the latest computerized control systems. The Bailey Yard command center is tied to the Harriman Dispatching Center in Omaha. Harriman controls hundreds of intercity trains daily throughout Union Pacific’s 23-state rail system. 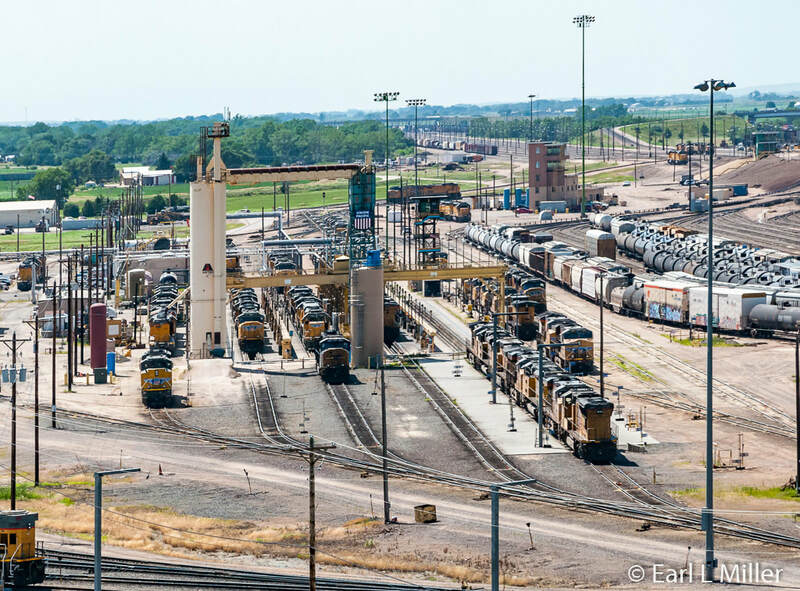 Union Pacific has 2,600 employees assigned to Bailey Yard. The idea to build the tower was conceived in the mid 1990's to replace the viewing platform at Bailey Yard that was falling into disrepair. It opened June 26, 2008. It is operated by a private nonprofit organization that has a representative from the Union Pacific on its Board. 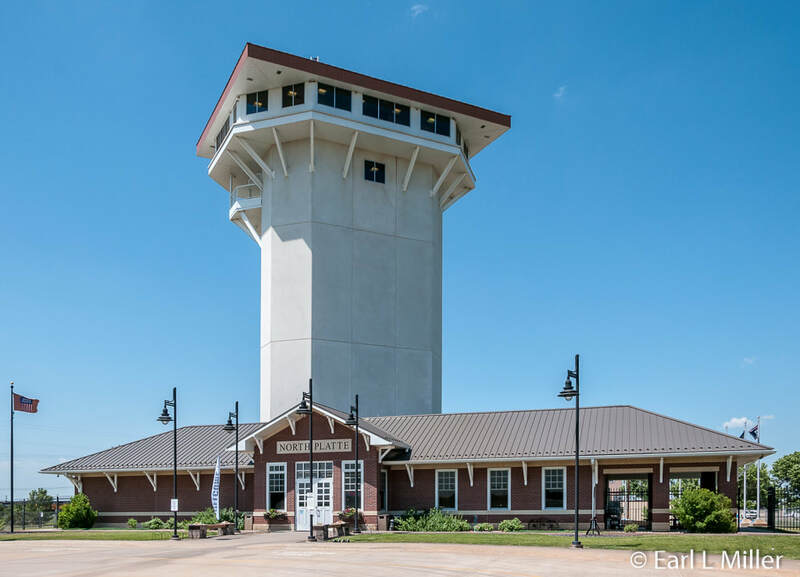 More than 30,000 visitors annually take a trip via an elevator to the seventh or eighth floor of the Golden Spike Tower for a bird’s-eye view of Bailey Yard. Surrounding the tower in the courtyard are 23 flags representing the states that the Union Pacific Railroad operates. A brick pavilion honors members of the community, Union Pacific employees and others with commemorative bricks embossed with the person’s name for which the brick was purchased. On the grounds, near the tower entrance, is a vintage dining car, currently under restoration. Visitors purchase tickets downstairs. 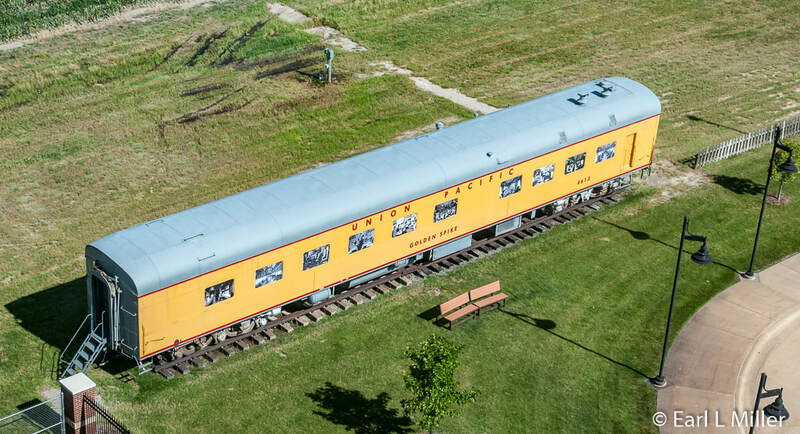 You can view historical displays on the Union Pacific, North Platte, and Bailey Yard. One is a railroad “Hall of Fame” about influential people that helped to build Bailey Yard. Those names include Buffalo Bill Cody; Edd Bailey and Bill Jeffers, presidents of Union Pacific; and George Vroman, the chairman of the Brotherhood of Locomotive Engineers. You will also see equipment exhibits and can watch a model train traveling above guests. Take time to watch a ten minute video initiating you to Bailey Yard and the Union Pacific. Then visit the gift shop with the typical T-shirts and sweatshirts to souvenirs and railroad novelty items. Outside food and beverages can be brought in. However, no alcoholic beverages are allowed. The gift shop does have snacks and refreshments available for purchase. Friendly pets are welcome on a leash or in a carrier. Dog bags are available for your canines after their walk in the courtyard. Take the elevator to the open air observation deck on the seventh floor. You will see multimedia displays about the North Platte Canteen and a model of Bailey Yard’s diesel shop. The enclosed 8th floor is complete with coin-operated binoculars. You will frequently find a guide, usually a retired railroad employee, at that level, who will explain what is taking place and relate their employment experiences to you. It has displays on the railroad’s history and Orphan Trains. The Golden Spike Tower’s revenue comes from admissions, gift shop sales, grants, and private donations. It has also been granted 2% of each hotel stay in the North Platte area until 2029 to assist with operating expenses and the building loan. The Tower’s address is 1249 N Homestead Road. Their phone number is (308) 532-9920. Hours are May 1 to September 30, 9:00 a.m. to 7:00 p.m. daily. From October 1 through April 30, it’s 10:00 a.m. to 5:00 p.m. daily. Special twilight tours are held the third Saturday of the month. Admission is for adults $7, seniors ages 62+ $6, ages 6-16 $5, and five and under free. 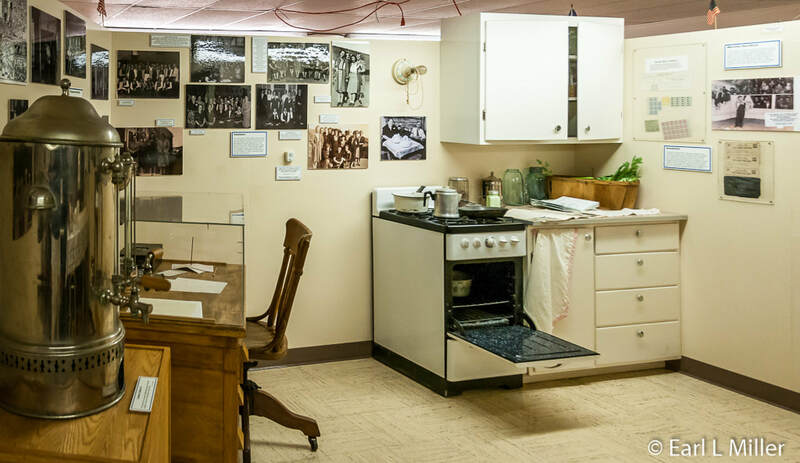 A visit to Lincoln County Historical Museum’s main building is like exploring a huge attic containing artifacts tracing Lincoln County’s history from prehistoric days through modern times. Outside is their Western Heritage Village consisting of historical structures from Lincoln County. The museum has an excellent gift shop loaded with Grow Nebraska products as well as artwork from local artists and craftsmen. You can even buy corn cob and sand cherry jelly. It also has items ranging from books to T-shirts about the canteen. 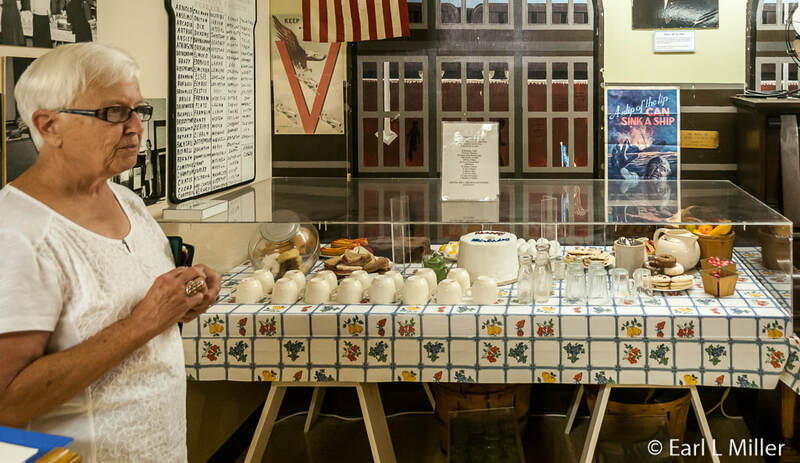 A major section in the building is dedicated to the North Platte Canteen where six million soldiers on military trains were served a bit of home from 1941 to 1946 by volunteers. Besides numerous photographs, see a typical kitchen from that era and a table laid out as if the soldiers were coming through. It started on December 17, 1941 when friends and family of the local Nebraska National Guard’s Company D were expecting their soldiers to return home on the train. They had come to the North Platte Depot to give them their Christmas presents. When the train arrived at the station, their anticipation ceased when their boys weren’t on the train. Instead, it was Company D from the Kansas National Guard who arrived. One person stepped forward to give the troops presents. Others in the crowd soon followed. 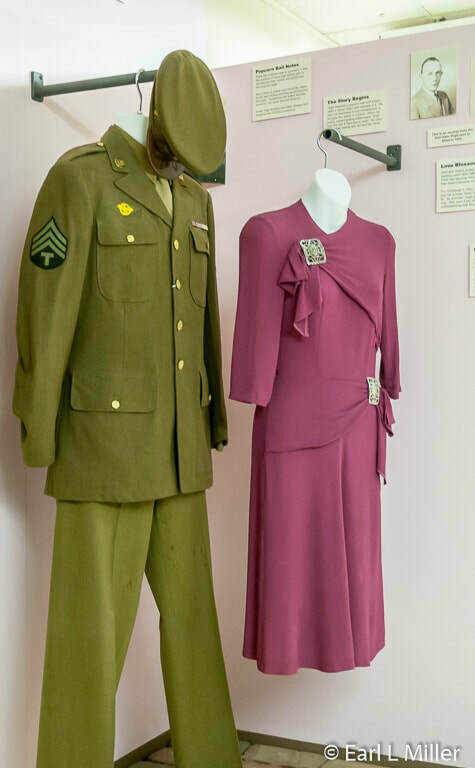 The soldiers’ happiness at receiving these gifts sparked an idea in Rae Wilson’s mind.Wilson, a store clerk, wrote to the North Platte Daily Bulletin the next day to advocate support for a canteen in North Platte that met every troop train traveling through the town. North Platte’s Red Cross had done it in World War I, and she believed it could be done again. The North Platte Canteen met its first troop train on December 25, 1941. At first, baskets of food were prepared at Cody Hotel across the street from the depot. Originally, because of security, the troops stayed on the train. The women handed cookies, milk, fruit, cigarettes, and magazines up through the windows. Before long, the number of troops coming through town overwhelmed the facilities at the hotel. Wilson contacted the Union Pacific president, William “Bill” Jeffers, whose boyhood home was in North Platte. It’s one of the buildings you can see if you visit this museum today. She asked Jeffers if the canteen could be run in the depot’s vacant lunchroom. Jeffers agreed and preparations were made to move the canteen as soon as possible. This was its location until the last troops came through after the war ended. The troops stayed for about ten to fifteen minutes. When the effort took a toll on Wilson’s health, Helen Christ took over the operation for the rest of the war. From 1941 until the canteen closed, 55,000 volunteers from 125 different towns, some as far away as Julesberg, Colorado, provided food and time to make sure each train was met and each soldier fed. The number of soldiers served averaged 3,000 - 5,000 servicemen a day. By the war’s end, it had grown to almost 10,000 troops a day. The Office of Price Administration ordered rationing and price controls of basic items such as sugar, coffee, gasoline, shoes, tires, and more. Citizens were given ration books that included stamps for purchasing these items. This made the Canteen’s job more difficult as sometimes items grew scarce. Volunteers donated their extra stamps to the canteen to buy needed items. Children gave up their birthday cakes. Women at the canteen made birthday cakes daily for the soldiers with Angel food cake the most popular. If a soldier said that it wasn’t his birthday, a volunteer would say, “Happy birthday anyway” and give him a cake. When farm wives ran out of chicken eggs, they used turkey eggs in those cakes. They used leftover egg yokes from the angel food cakes to make homemade yellow mayonnaise for sandwiches. Gas rations were passed on to those women who had to drive as many as 200 miles to North Platte to volunteer. Extra farm produce came to the canteens instead of being sold. Gene Slattery, a local boy, auctioned off his shirts at the local livestock sale barn every week. When he ran out, stores in town supplied him with new ones. He raised $2,000 for the canteen. Popcorn balls were also prepared and handed out by girls on the platform. Sometimes these teenagers (ages 16 and older) put their names and addresses inside these balls and acted as pen pals to the soldiers. They stood with baskets on the platform full of apples, cigarettes, magazines, and candy, besides the popcorn balls, and would pass these up to the soldiers unable to get off the train. The museum relates the story of Ethel and Virgil Butolph who were married for 35 years because of one popcorn ball. The canteen continued as the soldiers came home after the war. It was closed April 1, 1946. As the women were cleaning up for the last time, a troop train arrived. Unable to give the soldiers anything but the coffee they had made for themselves, they filled up the cups and handed them out. Unfortunately, the depot was torn down in 1971 by the Union Pacific. Outside of artifacts, photographs, and memories, little remains of one of America’s largest volunteer efforts. The main building of Lincoln County Historical Museum contains period room settings such as a dining room and parlor, china, quilts, and fashions. One section contains multiple musical instruments. They have benches and front doors from the depot as well as a large model of the community’s first Catholic Church. In the World War II section, they have cases of military uniforms and of guns. Children can look through a Sherman tank periscope and try on helmets. In the German case, they have gas masks and spike helmets. Present is a doctor’s office with examining tables and a radiology machine, telephone office with a switchboard, post office, and a beauty shop. You will see replica models of the depot where the canteen was located, the high school, Cedar Bowl Lane, and Pawnee Drive-In Movie Theater. You can operate the model railroad for a quarter. 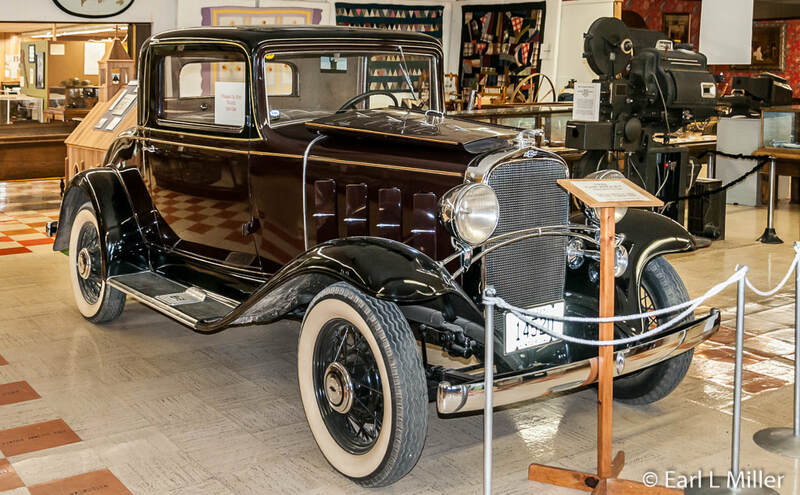 View a 1932 Chevrolet standard coupe with 25,000 original miles or check out a 1921 Simplex Super Projector used to show movies. Read signs about aspects of North Platte: railroading, business, personal services, ranching, farming, and education. Native Americans are remembered. The museum’s extensive arrowhead collection dates from eight to 10,000 years ago. Their Lakota culture beadwork is exquisite. Jim Griffin, director of the museum, made an extensive diorama of Fort McPherson. If you press a button, you can hear a script about six of the buildings including the company quarters, hospital, magazine, and cavalry stables. Cases are full of artifacts from the fort such as canteens, bottles, and horseshoes. 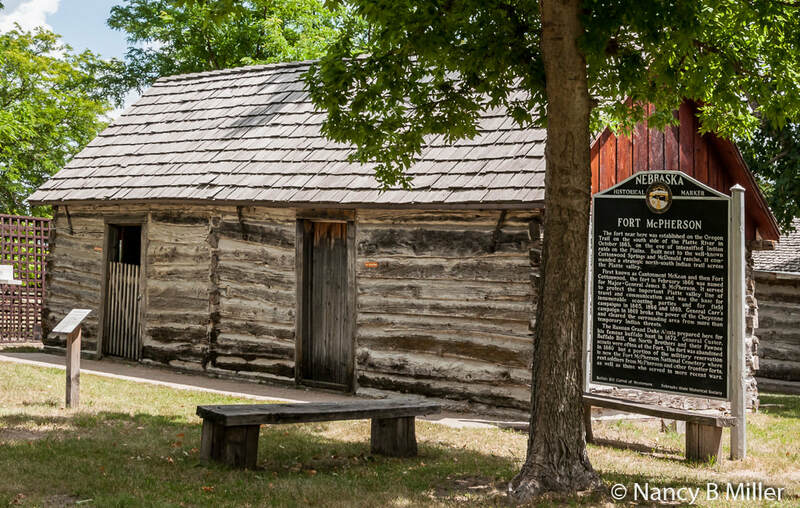 Located on the Oregon Trail, on the south side of the Platte River, Fort McPherson was established in 1863. Its job was to protect travel and handle communication while serving as a war base for many scouting parties. It is where the Grand Duke Alexis prepared for his hunt. General George Custer, Buffalo Bill Cody, the North Brothers, and Pawnee scouts were often at the fort. It was abandoned in 1880 and is now a national cemetery. Step outside in the back to see 22 historic structures. 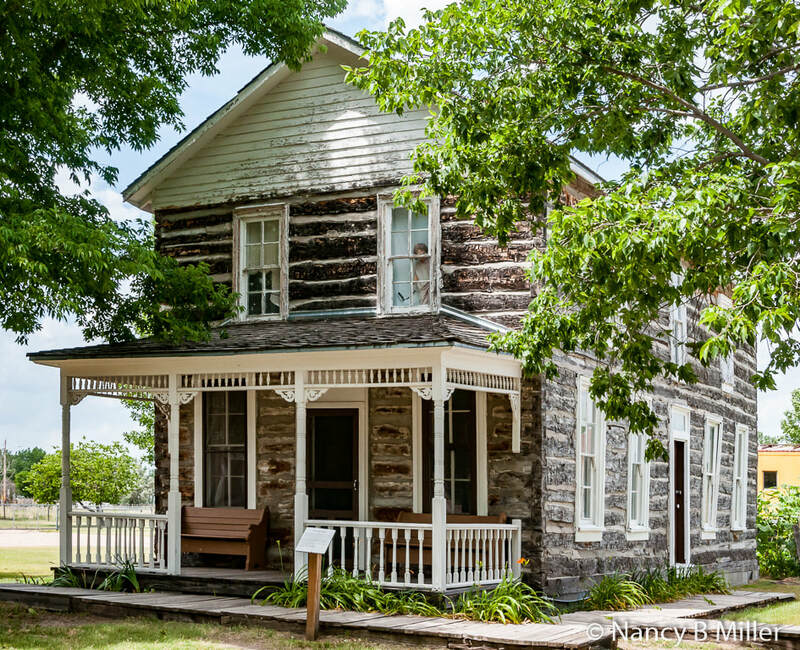 Among these is the only cabin remaining from Fort McPherson, a Pony Express station, and a Sears Roebuck Catalog home. 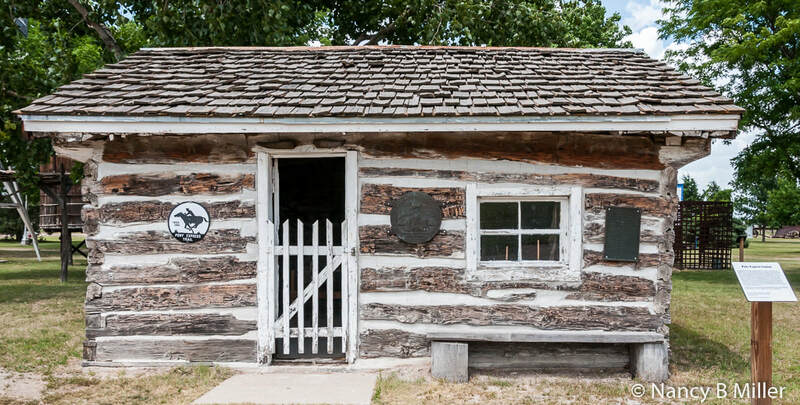 It has a jail, barber shop with artifacts, working blacksmith’s shop, the Brady Island Union Pacific Railroad Depot, and a caboose. Visitors also find a Lutheran Church, 1903 country school, and general store. The E. E. Ericsson House, with furnishings, housed the county’s first settler. It is a log structure where each log was shaped and interlocked with a minimal use of square nails. Arriving in Nebraska from Sweden in 1867, Ericsson was the first to take advantage of the Homestead Act in Lincoln County. The home was originally located on the grounds of Fort McPherson. Due to personal differences with the fort’s commanding officer, Ericsson dismantled the structure log-by-log, numbered them, and reconstructed his home on his homestead. Rebuilding was a slow process since his windows came from Chicago at the time of the Great Chicago Fire. Oregon Trail travelers stopped at this home to buy water. One piece of equipment called the “ditch plow” is on display at the museum and is believed to be the only one of its kind in existence in the United States. It was built for a man who made a living digging irrigation canals and wetlands and was pulled by 48 head of oxen. When the plow was in a marsh or lake, they would use capstands to pull it. It was found on a farm north of North Platte. Lincoln County Historical Museum is located at 2403 North Buffalo Bill Avenue. The phone number is (308) 534-5640. It’s open Memorial Day to Labor Day from Monday through Saturday from 9:00 a.m. to 8:00 p.m. and Sunday 1:00 p.m. to 8:00 p.m. From Labor Day through the end of September, Monday through Saturday 9:00 a.m. to 5:00 p.m. and Sunday 1:00-5:00 p.m. During the winter months, it’s open by appointment. Admission is $3. 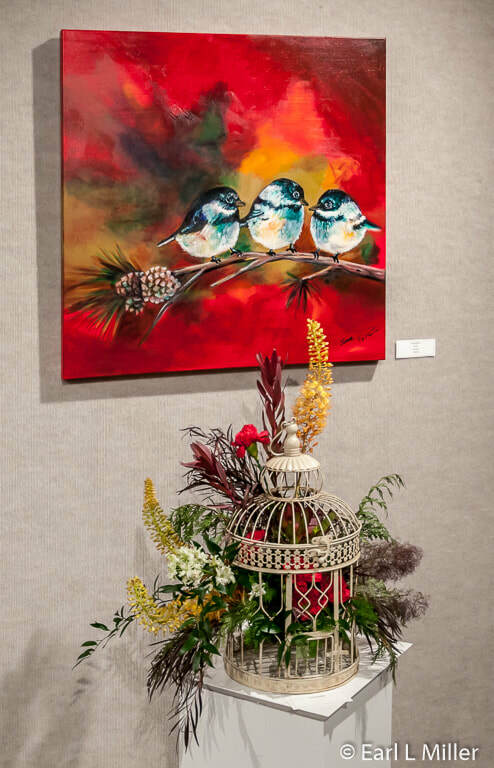 Located in a former 1913 Italian Renaissance Revival post office, Prairie Arts Center is North Platte’s place to view and purchase artwork as well as take a class and create your own masterpiece. The structure’s restoration is significant since its style was rarely used outside of large cities. Only 18 Italian Renaissance buildings are in Nebraska with 11 in Omaha and four in Lincoln. The building is registered with the Nebraska State Historical Society and listed on the National Register of Historic Places. Used as post office until 1964, its title transferred to the Junior College District which opened in August 1965. Mid Plains Junior College used it for classes and offices until 2000. 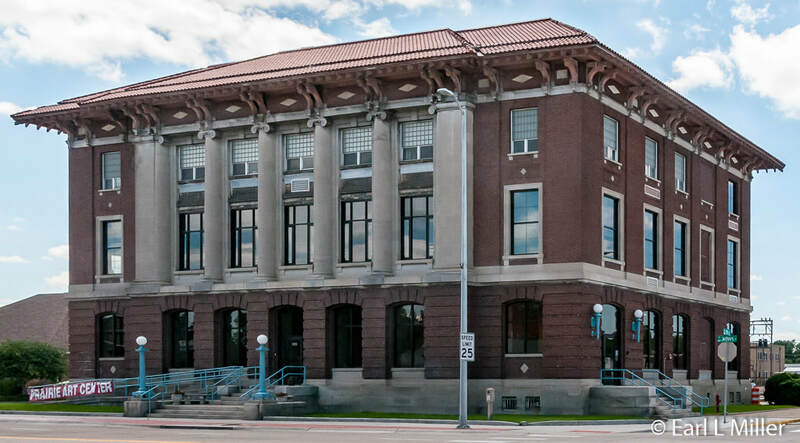 That year it was purchased by a private individual and donated to North Platte to become city offices, which never happened. Similar to the Canteen, the restoration of the building has been another community project done by volunteers. In this case, they have done 75% of the work. In 2008, Creativity Unlimited Arts Council (CUAC) took over its ownership with a promise to raise $250,000 for a restoration plan. The Community Development Block Grant money they received has been helping them achieve this goal. It is estimated the total cost will be $3.2 million. Besides grants, the organization operates on donations with no funding from the city. The basement level opened in 2013 after thousands of volunteer hours and lots of fund-raising. Partnering with Mid Plains, their pottery, sculpture, and 3-D art classes are held on that level as are CUAC’s studio classes. They have a kiln room, a pottery drying room, and a woodshop in the basement. In November of 2015, the historic east hall; their main gallery, the Focus Gallery; and their gift shop Wildflower opened on the first floor. The museum also has a sculpture garden. The CUAC is now working on the third floor. It's the future home for adult, and children’s classrooms and studios. It’s to be the home for pottery, sculpting, and woodworking. 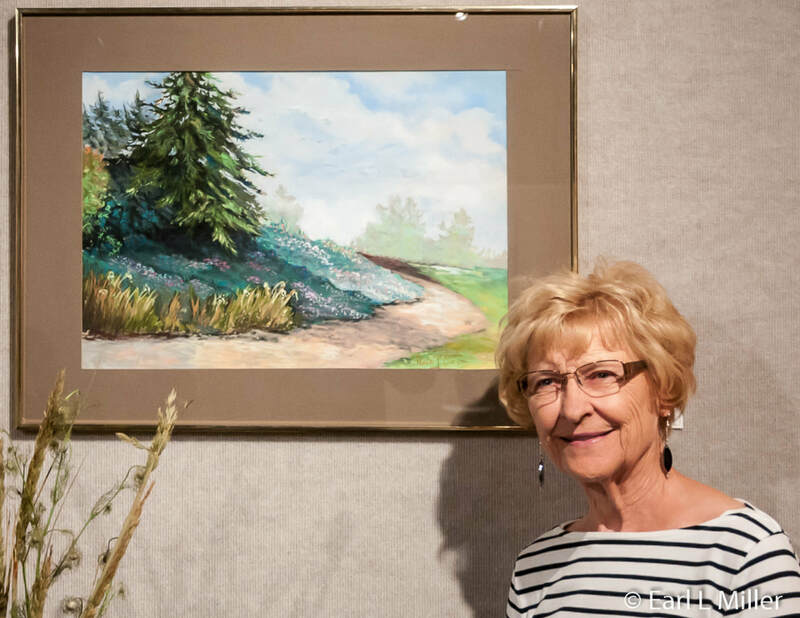 The gallery displays artwork of local and regional artists as well as has traveling exhibits. These are changed monthly. 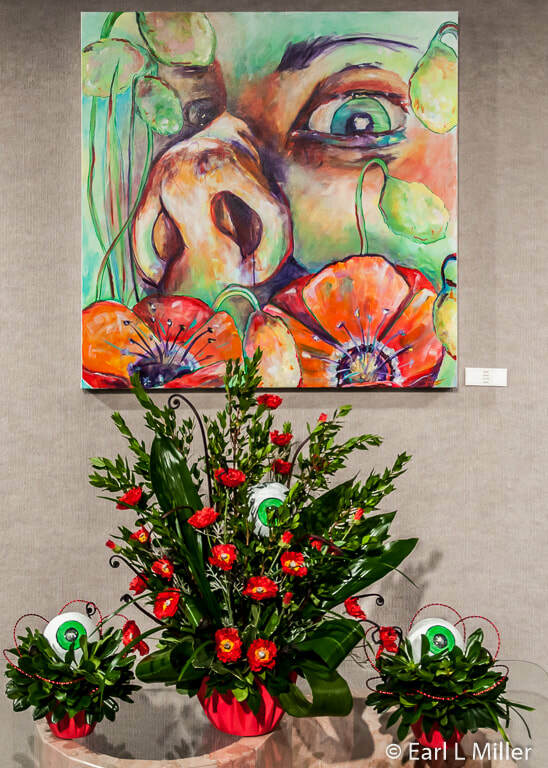 The exhibit we saw, “Art Creations and Floral Interpretations,” paired themes with actual floral arrangements from local companies. Some of these were Spring Time by Wava Best, who was our guide through the Center. The floral arrangement was by Sarah Talbott of the Flower Market. Conversations by Sue Perez. The floral arrangement, Birds - Bird Cage was by the Flower Market. Senses by Val Hynde was paired with flowers from Westfield Floral arranged by Kristine Henningsen. We also eyed a sculpture titled Canteen Lady by Sandra Johnson which showed a canteen woman carrying a basket. When finished, Prairie Arts Center will provide opportunities in the form of classes, exhibits, performances, and events in the arts and humanities to people of all ages in North Platte and the surrounding area. The CUAC also wants it to be a catalyst for collaboration among local and regional arts organizations. You can say this is training of a different sort. Prairie Arts Center is located at 416 N. Jeffers Street. Their telephone number is (308) 534-5121. Hours are Tuesday- Saturday 11:00 a.m. to 4:00 p.m. Closed Sunday and Monday. Admission is free but donations are encouraged. Note: You, too, can join the notification list for new articles at no charge. Just fill out the Contact Form - your request, name, city, and state.It comes directly to Nan Miller, and we will put you on the list promptly. We never give out emails or personal information.